This name substitutes the 美 (“beautiful”) in 美好 (“wonderful”) for the 每 (“berry”) in 草莓 (“strawberry”). The result is a word that sounds exactly the same, but makes a berry pun. Partial transliterations of “mint” and “chocolate” still manage to carry the idea of “chocolate” in a cute-sounding name. The 蜜 is more likely to be mistaken to mean “honey” (蜂蜜) than to be understood as “mint” (薄荷) though. Once again, we have the 莓 pun, but this time the word 美莓 is substituting for the word 妹妹, which means “little sister,” but can mean “young woman.” 美莓 has different tones (3-2) than 妹妹 (4-5), but the tones on 美莓 mimic the non-standard Taiwanese pronunciation of the word 妹妹, which sounds very cute to mainlanders. This name is a play on the onomatopoeia 吱吱喳喳, the sound of noisy birds (or possibly monkeys?). The character which replaces the two 喳 characters is 蕉 of 香蕉, “banana”–the monkey connection. If you want to take a look at all the names yourself, I have scanned the menu and put it online (front, back). The ones above are the best ones, though. A lot of the other ones aren’t creative at all. Cold Stone Creamery has a Chinese website, but it gives me an interesting “The page must be viewed over a secure channel” error. Update: the link doesn’t work if you leave off the WWW. Thanks, Micah. u can buy some imported ben and jerrys at city shop i think..
do they sing like the one in people squere? if they do.. it must be annoying cuz this store is kinda small.. 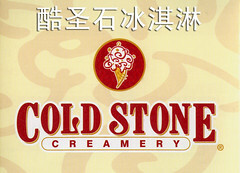 The “Our Strawberry Blonde: 草莓美莓” could also be a play on 美眉, which would have the same tones. John, please forward your notes to upper management at Cold Stone Creamery. This type of creative work is ideally completed by the “in the know” American natives with a stout background in Chinese – that’d be you, John. In Taiwan, 妹妹 is mei3mei1. Close enough to mei2mei3? I remember the first time I went in to one in the states they asked if I had ever been there before. When I said “No, actually”, something terrible happened. They all started singing at me. Like AT me. I just turned around and walked out. Well, just to be clear: the Taiwan pronunciation of 妹妹 is not actually měiméi unless you are speaking to a child. That’s why Mainlanders find it so ‘cute’, because it is baby talk. They do this for many words, changing them all to third-second. I’ve never seen Ben & Jerry’s here. p.s., if you happen to know some Japanese, Japanese people pronounce “very” exactly as “beri”. I wonder whether the menu maker knew that already. A lot got lost in the translation for “Oh Fudge.” Also, if anything is “圣,” it should be the sinless ice cream.